Kyle Bennett this week joined Portsmouth on a two-year deal. Paul Dickov says Kyle Bennett was “badly advised” after ditching Doncaster Rovers for League Two Portsmouth. 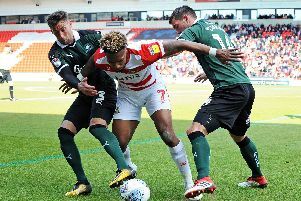 A clearly agitated Dickov has spelled out his frustration after seeing the out of contract 24-year-old slip through his grasp - claiming Bennett had verbally agreed to remain at Rovers. “It’s disappointing from our point of view,” said Dickov. “I don’t put all the blame onto Kyle. I’ve got a great relationship with the kid but he’s been let down by his advisors. “I spoke with Kyle a lot towards the end of the season and we put an offer to him that he shook my hand on verbally and said he wanted to stay and he was happy with [the offer]. I spoke to his representatives who hinted the same thing as well. “They were supposed to call two weeks ago to let me know what was happening and that never occurred. “I tried calling them late last week and still didn’t get a call back, then news broke about Kyle going down to speak to Portsmouth. “I eventually got a call on Saturday saying Kyle wouldn’t be signing for Portsmouth and that we could talk on Tuesday but despite numerous phone calls that didn’t happen and in the end I had to send quite a rude text [to his representative] to find out what was going on. He added: “I’ve been in the game long enough to understand how things work when players are out of contract and with agents. “The disappointing thing is the club’s looked after Kyle fantastically well for the last four years. “Without going into too much detail, during the two years I’ve been here, myself, my staff and the club have looked after Kyle through some difficult times. “If he was going to leave, like Dean [Furman] and Reece [Wabara] I would have been happy to shake his hand and wish him all the best but the fact I got a half-hearted text after I had to prompt the text is disappointing. “But you move on. Nothing surprises me. It happens all the time, clubs try and shaft players, players try and shaft clubs, agents try and shaft both. It’s part and parcel of the game.